The image and likeness of the Buddha is world renowned. Sitting in the lotus position, he calmly exhales with his eyes closed in a state of universal oneness. This image is a huge inspiration for people who need a friendly reminder that there are forces at play larger than themselves. It’s easy to get wrapped up in the day to day, but an image or icon of a Buddha statue reminds us to take it slowly. 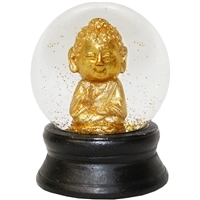 World Buyers offers a wide range of wholesale Buddha-themed decorations perfect for home, spa or sanctuary. For our retailers, you’ll find a wide range of Buddha décor, including candles, boxes, trays, lanterns, statuary, matchboxes, wall art and more. 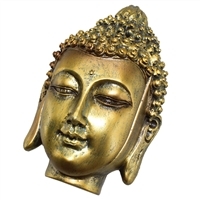 Our wide selection of Buddha gifts and décor will contribute to the serenity your customers are looking for as well as adding beautiful art forms to any surrounding. Ceramic Buddha with vintage pale blue glazing. His hand position is called the "yoga" gesture as it is commonly used for meditation and concentration. It also refers to attainment of spiritual perfection! This "mudra" hand position was used by Buddha during the his final meditation under the bodhi tree. Ceramic Buddha mini cup. Earthy tones with turquoise and brown glazing. Ceramic Happy Buddha mini cup. Earthy tones with sage glazing. Vitarka Buddha iridescent rainbow statue. The dominant iridescent color will vary. Some may be mostly gold, purple, blue or green. Iridescent Rainbow Buddha bust. The dominant iridescent color will vary. Some may be mostly gold, purple, blue or green. 3.75x4x5.75"H 6pc minimum. Must order in increments of 6. Ceramic gray Happy Buddha with raised bowl. Serene Buddha box is washed in lovely gold color. Face is lid and is attached with magnets to box. Lid is completely removable. Our Buddha line has always been a customer favorite at World Buyers. Whether your gift store needs wholesale wall decor or Buddha figurines, we have a beautiful selection of including colorful wholesale Buddha canvas prints at amazingly affordable prices. Enjoy a great selection of wholesale Buddha gifts like Buddha Wood Carvings, Candles and more. So make it easy on yourself with one-stop shopping with World Buyers for all your wholesale Buddha gifts!